Getting close to time to celebrate the Holidays and I hope your wishes for some iridescent treasures are granted! For now, it’s Stretch Tuesday with the BugDoc, again! In my last article, I started a review of some of the “minor” glass companies that made stretch glass. 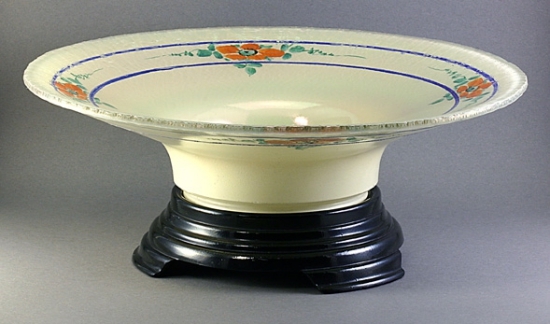 I will continue to cover some of the common Lancaster pieces – bowls and comports. I’ll also show you some of their marigold “rays” pieces which you have all seen, but probably didn’t know the maker!! 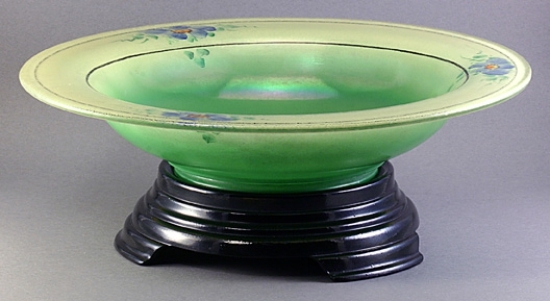 Lancaster mainly used two bowl molds (three if you include the bowl that was normally used for the covered bonbon base), and one comport mold (more correctly identified as a footed bowl). 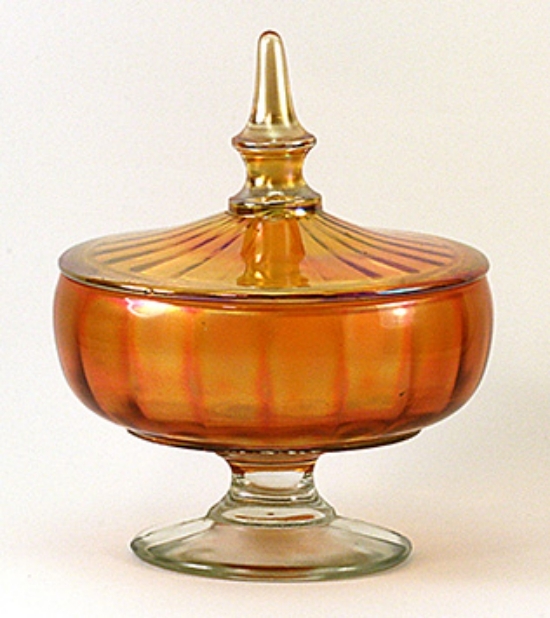 The smaller bowl has a 4-inch base, is shown in some Lancaster catalogues as #984D, and is usually flared out to the 9 to 10-inch range. It often has 45-degree, straight sides, but it can also have a flared and flat rim or a rolled rim. The 45-degree sided ones look exactly like a Diamond bowl, but the only time you’ll get confused is if you find a crystal Diamond one! Most of Diamond’s bowls are blue, green or purple. The #984D comes in all the Lancaster stretch colors – crystal stretch (Iris Ice), marigold stretch (Rose Ice and Aztec), Ruby Lustre (yellow to red-orange enamel), green lustre (dark yellow to green enamel) and white lustre (just white enamel). I described these colors back in the November 22 HOC posting. 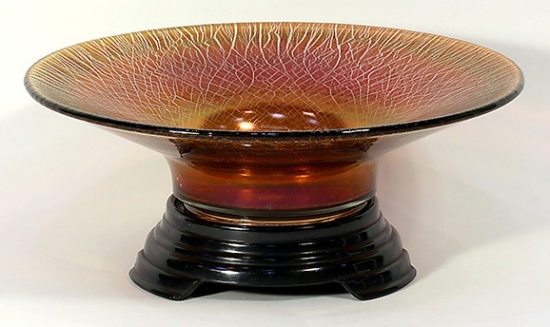 The larger bowl (Lancaster #86) has the same 4-inch base (so both bowls can sit on the one glass base that Lancaster made), but the sides of the bowl come straight up before flaring out to a 10 to 11 1/2-inch diameter. This bowl is usually just flared out gracefully, but I know of a couple of rolled rim pieces. 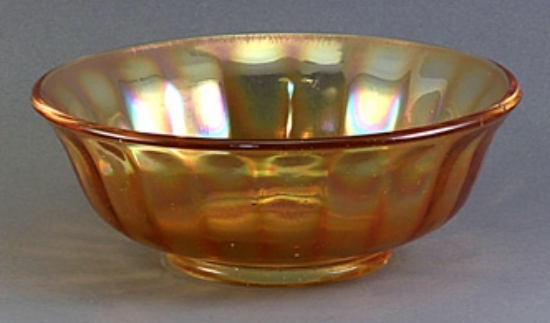 Like the smaller bowl, I’ve seen this bowl in Iris Ice and lustre colors, but finding a good marigold one (especially the dark Aztec) is not as easy. 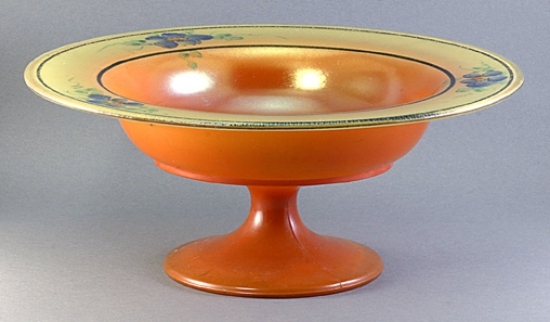 The high-footed bowl (Lancaster #85), which we would call a comport today, has a 4 1/2-inch diameter base and is usually flared out to about 9-inches. 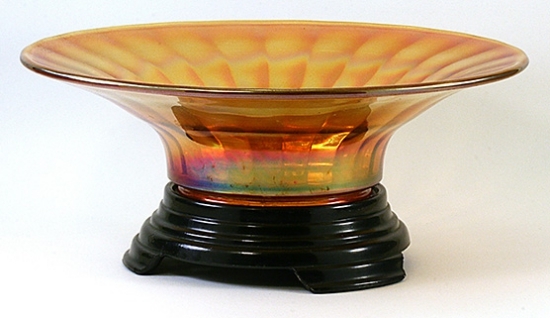 This piece can have the 45-degree sides, flared and flattened top or just flared at the top. Again, this piece can be found in all the Lancaster stretch treatments. 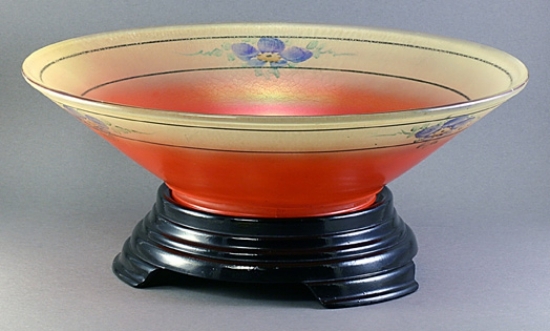 This form is also flattened down into a nearly unique cake plate. The cake plate is almost always found in the Rose Ice or Aztec (marigold tones), but I have one in pink glass with yellow floral decoration. Not an easy piece to find! To make things more interesting, Lancaster seems to have used a rib optic (actually flat rays) plunger with these molds to make a distinctive line of iridescent ware. Some of these are shown in some Lancaster catalogues with the designation of “H” after the normal Lancaster number, i.e., #86H. These pieces were obviously produced in quantity and you’ve all seen them! 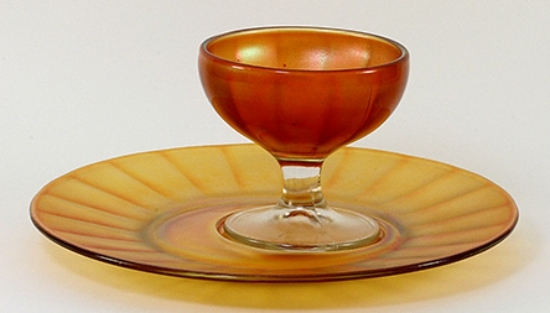 They are always a bright marigold, often with doping rivulets in the iridescence that can look like faint stretch marks, but are not true stretch marks made by reheating the piece after doping. 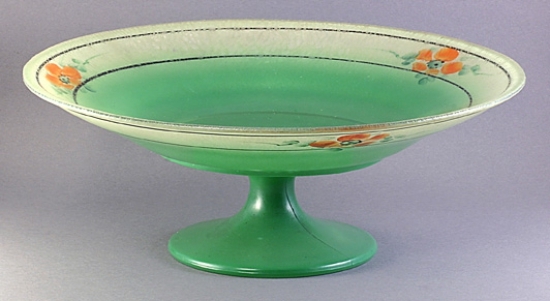 I’m including a footed, covered bonbon, #984H, #86H bowls, the #85H footed bowl and a sherbet and underplate set.